Situated slightly north of Matemwe in an elevated position, Matemwe Retreat enjoys unspoilt views through palm trees of the warm Indian Ocean and Mnemba Island. The north east part of Zanzibar Island is known as Matemwe. This area is famous for its fine white sand beaches, the contrasting colours of the Indian Ocean and the beauty of the coral reef around the Mnemba Atoll. Matemwe borders a small fishing village where local fisherman set out on a daily basis in their traditional dhows. The stretch of perfect beach alongside the main lodge is shared only with the fishing village, which is situated on the far side of the soft sand. There are not many beaches in Zanzibar still featuring only one resort. 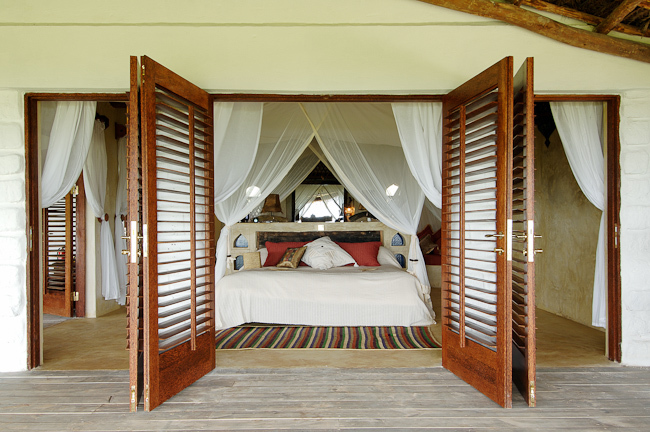 Care has been taken to ensure privacy and exclusivity throughout Matemwe Retreat. Matemwe is a 60 minute drive from Stone Town, allowing for easy day trips and excursions to the many varied and interesting places on offer in Zanzibar. Wooden walkways allow guests of the Retreat to access the main lodge should they wish to use the pool or dine in the restaurant. The villas were constructed by local craftsmen using local materials wherever possible: walls were made of local stone and the roof of Makuti thatch. Most of the furniture was made from locally produced coconut wood, while soft furnishings were produced by Zanzibari women. Matemwe Retreat consists of four self contained, private villas, each with uninterrupted views of the turquoise Indian Ocean. The villas have been designed to cater for those looking for pure escapism, as they feature in- house dining and private butler service. Private villas, luxuriously decorated in a Zanzibari theme with magnificent views over the Indian Ocean and nMnemba Atoll. Elegant décor blended in to the natural environment. Four private two level villas offering extraordinary views. Villas are raised to catch a breeze. The infinity plunge pool with a spacious mezzanine enables complete privacy for sunbathing, swimming, sundowners, meals or simply absorbing the glorious landscape. The generous air-conditioned bedroom with access to a generous wooden deck offers a king-sized bed with a framed mosquito net. Bathrooms are en-suite with double hand-wash basins, a lavish shower, and a large bath that invites to unwind overlooking the ocean towards Mnemba Atoll. A separate toilet is available. Shampoo, conditioner and moisturizer are provided. A hammock, a large couch and scatter cushions create a relaxing atmosphere on the wooden deck where you will enjoy tasty and fresh food. The ground floor of each villa features a private bar area, an air conditioned bedroom and a bathroom with double basins, shower and a large oversized bathtub looking out towards the ocean. A spacious veranda equipped with a comfortable couch and large hammock provides the perfect spot to unwind and watch the fishing dhows returning from sea. The private roof terrace hosts a plunge pool complete with both sun and shade decks. The villa is situated above a small beach which is shared by all 4 villas. A personal butler will look after all your needs throughout the duration of your stay. The chef will visit the villa on a daily basis; to discuss meal plans for the day. Your butler will assist with activity bookings, and recommend leisure interests depending on weather and tide conditions. Your butler will serve all meals and act as housekeeper to the villa. 24 hour hot water (solar& electricity powered), 24 hour electricity supply with back-up generator. All meals are served at a time of your choice. In addition we do not have a set menu so you can simply decide each morning what your individual menu will be for the day. The chef will make suggestions depending on special deliveries and the catch of the day. The exceptional cuisine is a fusion of traditional Zanzibari and international flavors. Seafood is a specialty, and fresh fish is prepared on a daily basis. A normal pattern will be wake up coffee or tea with biscuits, breakfast, lunch, tea and cake, pre dinner snacks followed by dinner – however you are free to set the meal pattern you desire. Any dietary requirements are catered for subject to availability. Notice prior to arrival is recommended. Villas have a private Bar and the bar in your villa is stocked with a variety of cool drinks, wines, beers and spirits. Drinks are available at all times of day from your own bar. Should you require any drink not stocked in the bar, your butler will do his best to oblige. Cocktails are mixed at the pool bar in the main lodge, so please allow time for the butler to prepare your drink of choice. Premium brand spirits and liqueurs, cellar wines and French champagne is available but is not included in your room rate. The pool bar at the main lodge is open from 10am to 11pm with a wide variety of wines, spirits, beers and soft drinks. Alcoholic and non-alcoholic cocktails are also available from the pool bar throughout the day. Feel free to invent your own cocktail with the barman. Do not be surprised if you are quite content to simply soak up the sun lying in a hammock with a good book or cocktail. Diving all levels of divers have the opportunity to explore the underworld of Mnemba Atoll. Both recreational and training dives can be arranged (extra charge). Local fishing in Ngalawa (traditional boats) and deep sea fishing takes you beyond the reef to deeper waters where you will be surrounded by shoals of different species of fish (inclusive). Water sports available sea kayaking, beach bats, kite and Frisbee (inclusive). Day trips and Spice Tours, Historical City Tours, Shopping Tours and Jozani Forest to visit the Red Colobus Monkeys, as well as Dolphin Excursions at Kizimkazi are just some of the many tours that can be organized by the Lodge (extra charge). Guided reef walks are available on request and subject to tide (inclusive). Walks to the local village and the fish market are lead by a local guide (inclusive). Spa Treatments includes massage, manicure, pedicures, Henna, hair braiding, waxing, facials. Either in your room or the treatment room (extra charge). The Escape to Infinity trip to a secluded sandbank is an ideal getaway. It includes breakfast, brunch or lunch, depending on the tides and time of day, a bottle of sparkling wine, snorkeling, sailing in a traditional Dhow boat and enough time to enjoy the heavenly isolation (subject to tides, extra charge).